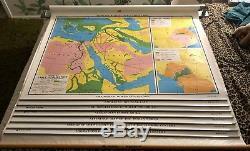 This is a USED Nystrom roll up/pulldown school wall map set containing 7 separate maps. This unusual map set depicts key events in ancient world history from the beginnings of civilization up through the fifth century. The individual maps are titled as follows. 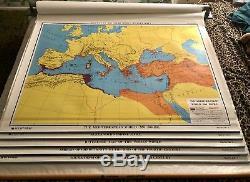 Empires of the Near East #K. Alexander's Empire 323 B. Reference Map of the Roman World #K. Spread of Christianity to the End of the Fourth Century #K.
Migration of the Peoples in the Fifth Century #K. The map set name is Nystrom World History 1KW1-7. Each map measures approx 51 wide by 36 high. 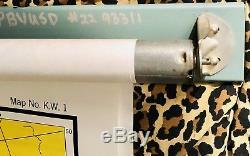 They are mounted on a spring loaded roller with attached steel mounting/hanging frame. The roller latching and retracting functions both operate correctly. 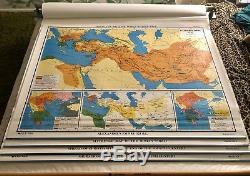 As you can see from the individual map photos above, the maps are in excellent condition with no snags, marks or tears. 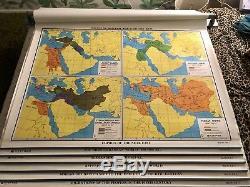 The maps have no publication date but are in the "modern" style using heavy paper backing rather than canvas and a steel frame hanger for the roll-up mechanism. 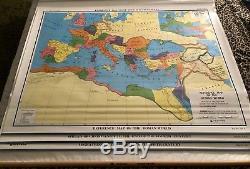 The item "VINTAGE NYSTROM SCHOOL PULL DOWN WALL MAP SET WORLD HISTORY 7 MAPS 1KW1-7" is in sale since Thursday, January 10, 2019. 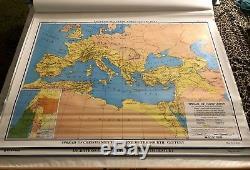 This item is in the category "Antiques\Maps, Atlases & Globes\World Maps". The seller is "cscarlett" and is located in Tehachapi, California. This item can be shipped to United States, Canada, United Kingdom, Denmark, Romania, Slovakia, Bulgaria, Czech republic, Finland, Hungary, Latvia, Lithuania, Malta, Estonia, Australia, Greece, Portugal, Cyprus, Slovenia, Japan, China, Sweden, South Korea, Indonesia, Taiwan, South africa, Thailand, Belgium, France, Hong Kong, Ireland, Netherlands, Poland, Spain, Italy, Germany, Austria, Bahamas, Israel, Mexico, New Zealand, Singapore, Switzerland, Norway, Saudi arabia, Ukraine, United arab emirates, Qatar, Kuwait, Bahrain, Croatia, Malaysia, Brazil, Colombia, Costa rica, Panama, Trinidad and tobago, Guatemala, Honduras, Jamaica, Barbados, Bangladesh, Bermuda, Brunei darussalam, Bolivia, Ecuador, Egypt, French guiana, Guernsey, Gibraltar, Guadeloupe, Iceland, Jersey, Jordan, Cambodia, Cayman islands, Liechtenstein, Sri lanka, Luxembourg, Monaco, Macao, Martinique, Maldives, Nicaragua, Oman, Peru, Pakistan, Paraguay, Reunion, Viet nam.